ISAF has announced that a Taliban operative who facilitated insider attacks was killed last week in Kunar province along with an associate. The operative was responsible for the May 11, 2012 green-on-blue attack in Kunar that killed one American soldier and wounded two others. According to yesterday’s ISAF press release, a Taliban facilitator named Mahmood and his associate Rashid, “a former Afghan National Army soldier who facilitated and assisted with insider attack planning and execution,” were killed in a security operation in the Ghaziabad district of Kunar province on Feb. 13. ISAF had previously reported that Mahmood was killed last fall. On Sept. 15, 2012, an airstrike in the Bar Kunar district of Kunar province killed a Taliban insider attack planner named Mahmood. At the time, ISAF said the slain Mahmood was responsible for the May 11, 2012 insider attack in Kunar. 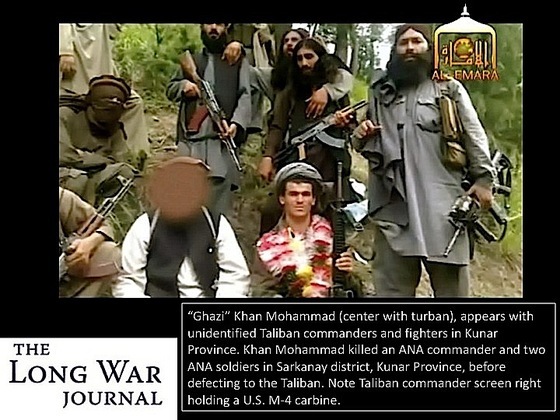 [For more information, see LWJ report, Al Qaeda ‘facilitator’ killed in Kunar airstrike.] ToloNews reported that Mullah Jalal, a Taliban leader for Ghaziabad district, was killed in another airstrike that same day in Kunar; Jalal had been shown in the Taliban video welcoming Mahmood. ISAF later retracted its claim that Mahmood was killed in the September strike; Mahmood was subsequently interviewed by The New York Times earlier this year. According to the LWJ Special Report, Green-on-blue attacks in Afghanistan: the data, approximately half of the attackers manage to escape after the attacks, and many take refuge with the Taliban. Reports such as yesterday’s, of inside attack planners and operatives being tracked down and killed or captured, are rare. Green-on-blue attacks have dramatically decreased since the beginning of the year. Only one such attack, on Jan. 6, has been reported so far in 2013. There were 61 green-on-blue attacks against ISAF personnel reported in 2012; 11 of those attacks took place in August. The decrease in attacks may be attributed to the drawdown in ISAF forces as well as the reduced partnering of NATO and Afghan personnel.